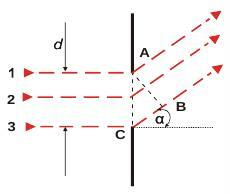 Diffraction, which arises in closeness of obstacle when light passes from point source, was investigated by Fresnel. In this phenomenon, which is called Fresnel’s diffraction, we face the problem of interference of spherical waves, based on Huygens principle. If we consider diffraction from distant source (monochromatic coherrent light), wavefront is nearly flat. We approach to phenomenon, which arise by diffraction of parallel beams with planar wavefronts, which are called Fraunhofer’s diffraction. If we are distant enough from the source, qualitative and quantitative analysis is explained by Fraunhofer's diffraction – in our case one-dimensional slit. Slit AC with width d is illuminated by perpendiculary falling monochromatic light (one coulour light, that is light consisting of only one wavelength) is in every point in whole its width source of elementary waves (simiarly as interface between two medium by refraction and reflection). From every point there is propagated spherical wave. Since beams come out in all directions, they interfere, and light behind the slit is not propagated uniformly in all directions, as shown in the experimental observation. We choose paralell bunch of beams that come out of the slit under the angle α (diversion of original way of beams before falling on the slit, see fig. 1). Figure 1 The Fraunhofer’s diffraction phenomenon on a slit. In result we observe pattern consisting of bright and dark stripes, which are symetricaly located from the center of the slit – so symmetricaly around main maximum. Intensities of minor maxima, as shown in fig. 2 and real experiment, decreases fastly. To explain the diffraction phenomenon, we will use Fraunhofer´s theory. 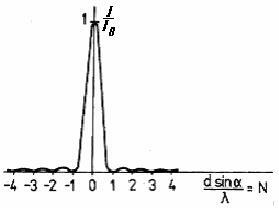 This theory assumes, that a wave that falls on a slit is planar (Fig. 1). Diffraction phenomena of this type are called Fraunhofer´s diffraction and we will explain it on the basis of the elementary concepts in Fig. 1 and Fig. 2.